The beautiful, the wonderful and the Crazy Life of The Ozturks: Kid: This is fun! Me: This is sad! 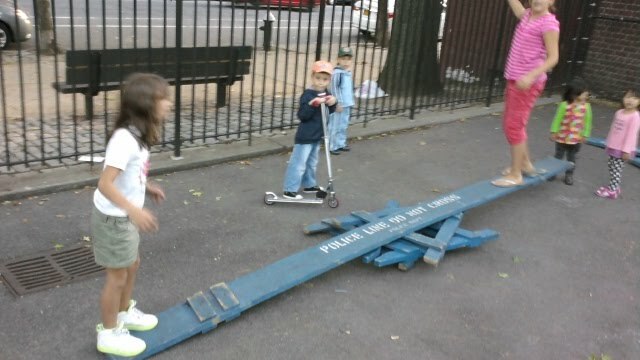 Some older kids deconstructed the barriers put up there to keep kids away from a particular corner of the park, and piled everything together to make a wobbly see-saw. At first, they tried sitting on the ends, pushing each other up and giggling like innocents kids do. Monster was curious too and they even let her sit in the middle securely for a while. 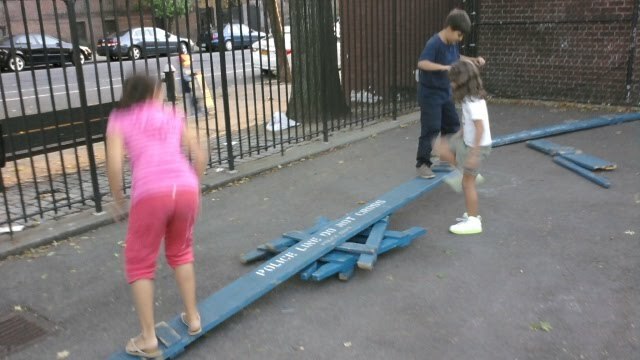 I felt such sympathy for these kids as they ooh'ed over the structure they rarely see in NYC playgrounds. I wished for a moment that the city would start including see-saws in the playgrounds again. The kids literally started jumping off of the slab of wood using it like a diving board! A few times Monster barely got out of the way as the slab swung sideways because someone just pushed it without warning. 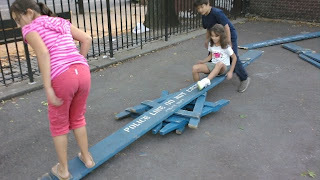 This is why city will never include see-saws in the playgrounds: Too many kids getting creative and breaking legs, too many lawsuits over a $100 piece of metal. Times like these, I wonder how in the world were we such benign children! What are us moms eating now to produce such dare devil children? Or is the lack of opportunities to get hurt naturally making kids curious to test their boundaries? Should there be a waiver of all rights when parents bring their children to a city park and let them play like we did in the old times? Would it be better for children to fall a few times, skin a knee or two and learn how to stay out of harm's way? Or should we continue over protecting our kids so much that they forget to look both ways when crossing a street?